When it comes to choosing an easy to use product this indoor Easy to close Well Built Gate is one of the best models in the market today. It is sturdy, dependable as well as affordable. It is easy to use for an adult, and shuts firmly with just a slight push of the hand, which makes the job easier for a busy parent or a caregiver who don’t have the time to use a latch or have their arms full at the moment of closing the gate. Just a simple push will close it firmly and keep your baby safe so that you won’t have to check on it every now and then. Another very important and rare feature of this model is that it swings open both ways. However, you can also choose to use a third optional lock available at the base that will let you control the direction of the door to open. Besides choosing a direction to open, you can also choose to have it open in a single way, and not two ways, depending on where you plan to install it. With its slim and attractive design it can fit easily in any part of your home. It comes with an easy-to-follow instruction manual and doesn’t take much time to install. It measures is 29.5 inches in height, and fits into openings that range from 29.5 inches to 35 inches wide. It comes with a 2-3/4 inch extension for areas that are wider. The pressure-mounting installation of this model is easy and doesn’t take much time to complete. With its two way swing and double-lock option, this easy to operate metallic gate can be used in any part of the house, and can be easily installed as well as re-installed. Additional extensions measuring up to 5-1/2 inch and 11 inch are available in the market that can cover a wide area up to 54 inch. The door is 21-1/2 inch opening which allows easy access for any adult. Though sturdy and dependable, this model has only one installation option – a pressure mount system. 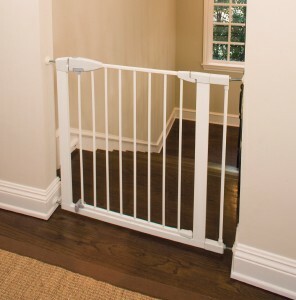 This is not always favored by most parents who want extra safe hardware-mount type of a gate that they can screw into their walls. It is also smaller in width compared to models in the market. It has a rating of 4.00 out of 5.00 stars on Amazon.com and is available at $42.49 with a free shipping option. With multiple lock options and a sturdy pressure-mount system, it is one of the best easy to close gates available in the market to keep your child safe and secure.